Contribute and FlashPaper are bit new to me. FlashPaper seems to be very useful to convert documents, presentations, spreadsheet and other files into Macromedia Flash documents or PDF files with one click and Contribute allows designers and developers from web maintenance, allowing others to very easily for static web contents. Now Dreamweaver supports RSS feeds, PHP5 and has a well made O’ Reilly references for JSP, XML, XSLT are some of the new features seems highly i4mpressive. 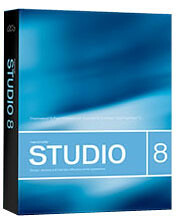 The Studio 8 offers rich functionality and cross-product workflows to create, code, and collaborate quickly. As a regular user of Macromedia products for all my web developments [Dreamweaver] and design [Fireworks] works, I could find lots of useful tips and new features through the sessions.